What’s the Difference Between Evaluation and Performance Measurement? Evaluation is about looking for improvement. But so is performance measurement. So why don’t we call them the same thing? Well, it’s because they’re different. Even though both performance measurement and evaluation are about deciding if something is better or not, they differ in a few fundamental ways. That might sound not quite right. Evaluation is about results too, isn’t it? Yes but in a different way. What impact did this education program have on teenage pregnancy in our city? How did speed-related traffic accidents change as a result of the lates TV advertising campaign? How much did customer loyalty change after we implemented our new loyalty rewards program? How is teenage pregnancy tracking over time? Is the rate of speed-related traffic accidents increasing, decreasing, or staying the same? What signals or patterns are there in the trend of customer retention rate? Evaluation looks for the story. Performance measurement looks for the signals. Evaluation certainly can use quantitative measures to decide if change has happened or not. But it also very often pulls qualitative information into the pot. Sometimes, as with the Most Significant Change Technique, the data is only qualitative. With performance measures, you really are looking for signals of change in the time series of quantitative data. 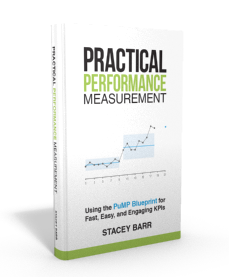 It’s not to say you should use your performance measures in isolation. When linked together, a set of performance measures can tell a powerful story too. The difference is subtle, but definitive. You can use evaluation to see if a specific initiative has had an impact on a particular performance measure. And you can use performance measures as tools within an evaluation. The perspective that each takes is a bit different, is all. What’s your opinion of the differences or similarities between evaluation and performance measurement? Share your suggestions on the blog. 3) Are performance measures used just to fill an agenda in boardroom or boardroom spends most of its time in learning from them – example: if a process is having varying random variations – does it make sense to provide existing trainings to workers which will improve the process to next levels of average or not? 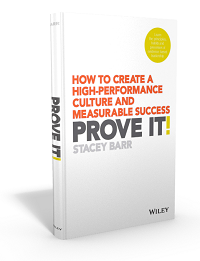 4) Are big scorecards displayed in work stations with top performers name listed on it (awards connected with achievements) to provide extrinsic motivation to work force or is their intrinsic motivation in the team to meet the company goals? More and more we are asking to provide results based metholodologies when replying for program tenders. This metholodology is classed as evaluation but I am struggling to see how this differs from Performance measures. Hi Sharon! It depends on whether the programs are ongoing, or once-off. If they are ongoing, then you want to monitor the results continuously over time and you’re interested in trends or signals that you might want to respond to. Your interest here is in continous improvement of the program. This is performance measurement. If the programs are once-off, designed to make a step shift or change in something, then you want to simply measure the before and after difference to see if the program had the desired impact. That’s evaluation. The measures you’d use in both cases are likely the same. It’s more about how you use those measures – either to assess before-and-after or to assess change-over-time.